Lawrence, Kansas (USA) -- There?s yard art, and then there?s yard art. Lawrence sculptor Dave Werdin-Kennicott?s latest work belongs in the latter category ? that of something different and special. ?This is not the typical tree-trunk carving that you?d see. The stereotype is a grizzly bear or a nest of eagles or a mountain man with a corncob pipe,? he says. On the east side of Dr. Dave and Gunda Hiebert?s Lawrence home, Werdin-Kennicott has been working eight hours a day, five days a week since June to create a 7-foot-tall wooden Buddha out of a stump that is all that remains of a diseased black locust tree. When it?s done, sometime in the next few weeks, the sculpture will look stunningly like a piece in the Asian collection at KU?s Spencer Museum of Art ? the Standing Amida Buddha, a Japanese wooden Buddha from the 1400s that the museum acquired in 1990. Found in Kyoto, Japan, it was obtained with a gift from former KU Chancellor W. Clarke Wescoe and his wife, Barbara Benton Wescoe. Werdin-Kennicott is about 90 percent done with his work, and the resemblance to the Spencer Museum?s Buddha is already remarkable. Dave Werdin-Kennicott works on carving a Buddha out of a dead locust tree at 1633 University Drive for Dr. Dave and Gunda Hiebert. Werdin-Kennicott has been working since early June on the sculpture, a replica of the Standing Amida Buddha (lower left) housed at the Spencer Museum of Art. His sculpture is simply a bigger version of the Amida Buddha, which stands 32 inches high and sits on a 10-inch, lotus-flower base. And Werdin-Kennicott?s Buddha will have a natural-wood finish, while the one at Spencer Museum is covered in lacquer and gold leaf. But the overall look, the sculptor hopes, will be much the same. ?The gold leaf and the folds (of the Amida Buddha?s robes) make it look like it?s on fire, a moment in time captured in wood,? says Werdin-Kennicott, 36. ?I want to get the serenity of the figure, the gesture that?s created by all the folds and curves in the robes.? Another example of Werdin-Kennicott?s work is one of eight pieces chosen for this year?s Outdoor Downtown Sculpture Exhibition. ?Bigfoot,? a 10-foot-tall, 500-pound metal sculpture, is located at one entrance to South Park. Transforming an eyesore of a diseased tree into a Buddha sculpture was Dave Hiebert?s idea. Dave Werdin-Kennicott removes wood from the lotus-flower base of a Buddha sculpture he?s carving from a dead locust tree stump. Werdin-Kennicott has used chisels, sanders, grinders, drills and even chain saws on the project. ?It was a dying locust tree, and I detest locust trees. They drop their leaves twice a year, and it makes a mess. And I was afraid it would fall over and hit the house. So we cut it down, and I had them leave 7 feet (of the trunk) to make a statue,? he says. ?After it was cut down, I started thinking about what piece of art I knew and loved. I knew the Amida Buddha from the Spencer. I?ve taken classes of students by to see it.? Dave Hiebert is a docent at the museum, where he also serves on the advisory board. His wife is president of Friends of the Art Museum, a member organization. ?Dave (Werdin-Kennicott) was the only person in town who was interested in doing this. Jon Hachmeister recommended him to me,? Dave Hiebert says. Hachmeister is an associate professor in KU?s art department. Werdin-Kennicott is a KU graduate student, working toward his master?s in sculpture. He earned his bachelor?s in design, specializing in metalsmithing, from KU in 1990. Dave Werdin-Kennicott has spent weeks creating a Buddha statue at 1633 University Drive. The locust tree was dying when it was cut down, leaving a tall stump for the artist to sculpt the figure. He is also a graduate teaching assistant for Hachmeister. ?Dave (Hiebert) contacted my professor by e-mail about a year ago. He wanted to know if he knew anybody who could carve a tree stump into a Buddha,? the sculptor says. The Hieberts then commissioned Werdin-Kennicott to create the sculpture. They decline to say how much they?re paying him for the work. ?I?ve done carving before, but never like this, on this scale. This is a monster project,? Werdin-Kennicott says. ?I knew it was a tremendous undertaking. I wasn?t sure I?d be able to do it.? 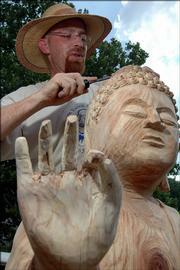 Dave Werdin-Kennicott works on the 7-foot-tall Buddha sculpture he?s creating for Dr. Dave and Gunda Hiebert. His teacher, however, had no doubts. ?I think that Dave has a great deal of talent, and he is extremely adaptable,? Hachmeister says. ?I knew that he could do what the Hieberts wanted ? that he would not only be willing to do it, but that he would be able to.? Werdin-Kennicott?s sculpture is the perfect addition to the Hiebert home, which is inspired by Japanese architecture inside and out. 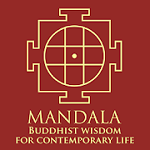 The Amida Buddha represents the spirit of the Western Quadrant of the universe according to one form of Buddhism practiced in Japan, called Pure Land Buddhism. It follows the Kei School tradition of the master sculptor Kaikei, who originated the style in Japan in the 13th century. The wooden Buddha at the Hiebert?s home is flanked, on the right, by a welded-steel sculpture of a samurai warrior by Lawrence artist Ardys Ramberg. Several feet behind and to the sculpture?s left is a tall thatch of leafy bamboo plants, often a fixture in Asian art. The sculpture faces west, so the Hieberts can appreciate it from their eastern-facing kitchen windows. Though it?s not yet finished, the Hieberts are thrilled with Werdin-Kennicott?s effort. ?This is so much more than what I bargained for. I?m overwhelmed by the quality of his work,? Dave Hiebert says. ?I thought he (Werdin-Kennicott) would do a rough replica, giving the idea of a Buddha. But he?s creating a masterpiece,? Gunda Hiebert says. ?He?s entered into this as a spiritual quest. 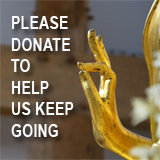 He?s done so much research, trying to get into a mindset where he understands the Buddha.? Turns out the sculptor lives across the street from the Kansas Zen Center, 1423 N.Y.
Gunda Hiebert has found meaning in watching Werdin-Kennicott transform a stump, through hard work and artistic vision, into something special. ?It?s almost as if the locust tree is saying, ?I?ve been a locust tree all these years, but now a Buddha in me is coming out,?? she says. Lawrence sculptor Dave Werdin-Kennicott is on vacation for a week, but he usually works on his carved wood replica of the Spencer Museum of Art?s ?Standing Amida Buddha? between 9 a.m. and 5 p.m. Monday through Friday at the home of Dr. Dave and Gunda Hiebert, 1633 University Drive. Werdin-Kennicott welcomes people to come and watch him work on the 7-foot-tall Buddha, fashioned from the stump of a black locust tree. But he advises that he might not be able to talk and answer questions when he is deeply absorbed in the project. Dave Hiebert says it is fine for visitors to touch the Buddha sculpture with their bare hands, but not with anything that might mar the natural-wood finish. Werdin-Kennicott, who has a business called ?Measure Twice, Cut Once, Inc. ? Smiling Dave the Handyman,? can be reached at 979-7839. He creates sculpture and provides handyman services and landscape design.